This chapter challenges exogenous accounts of the neoliberal transformation in Central and Eastern Europe (CEE) and the former USSR by analysing the gradual ascendancy of ‘proto-neoliberalism’ in Hungary before the regime change in 1989–90. Through a case study of the influential Financial Research Institute (Pénzügykutatási Intézet, FRI), the official research institute of the Ministry of Finance, and an in-depth analysis of ‘Turnabout and Reform’ (Fordulat és Reform), a document published in 1987 by a group of radical reform economists associated with the FRI, the chapter looks at how they interpreted the deepening crisis of the Kádár regime and what methods they employed in order to reorient reform debates along neoliberal lines. The chapter demonstrates that neoliberalism was not an ‘imported project’, which arrived ‘from the West’ on the eve of the transition, but rather a largely ‘home-grown’ programme, developing in dialogue between radical reform economists and reform-minded political elites. 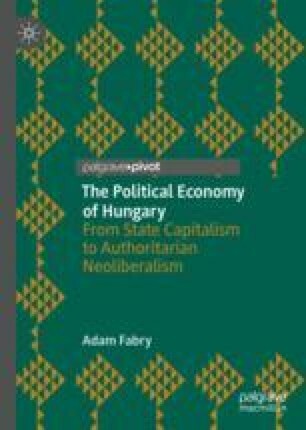 In this regard, the essential aim of the ‘neoliberal turn’ was to reconfigure the Hungarian economy in line with the exigencies of the capitalist world economy, while ensuring that the political transition went as smoothly as possible. While obviously a repudiation of past policy, policymakers in Budapest thus pursued similar objectives as central planners under ‘actually existing socialism’. BAL. (1989, February 11). A Baloldali Alternatíva Egyesülés alapítólevele. Baloldali Alternatíva Egyesülés. Retrieved June 4, 2018, from http://www.bal.hu/magyar/alaplist/alaplev1.htm. Krausz, T. (1990). Kelet-Európa konzervatív forradalmai – Fordulat Kelet-Európában: Mítosz és valóság. Eszmélet, 1(5). Retrieved June 4, 2018, from http://www.eszmelet.hu/krausz_tamas-kelet-europa-konzervativ-forradalmai-fordulat. MOMA. (2013). A MOMA célkitűzései. Retrieved November 4, 2013, from http://www.moma.hu/rolunk/celjaink/#rtop. Szegő, A. (1989). Világgazdasági függés, eladósodás, válság. Eszmélet, 1(1). Retrieved June 4, 2018, from http://www.eszmelet.hu/szego_andrea-vilaggazdasagi-fugges-eladosodas-valsag.